An ode to the best romantic Bollywood classics from the 50 till 90’s by international performers Navin Kundra, Vasuda Sharma & 515Crew. Enjoy this concert of 2-hours with your family and friends. Lucky you, 7th of October you can park free of cost in front of the venue. Zing uit volle borst de nostalgische Bollywood filmliederen mee uit de jaren 50 tot 90 met de Britse zanger Navin Kundra en de Indiase pop-diva zangeres Vasuda Sharma. Samen met de beste Britse Bollywood-​band The515Crew nemen de artiesten jong en oud mee op een onvergetelijke 2-uur durende muzikale reis vol verrassingen. 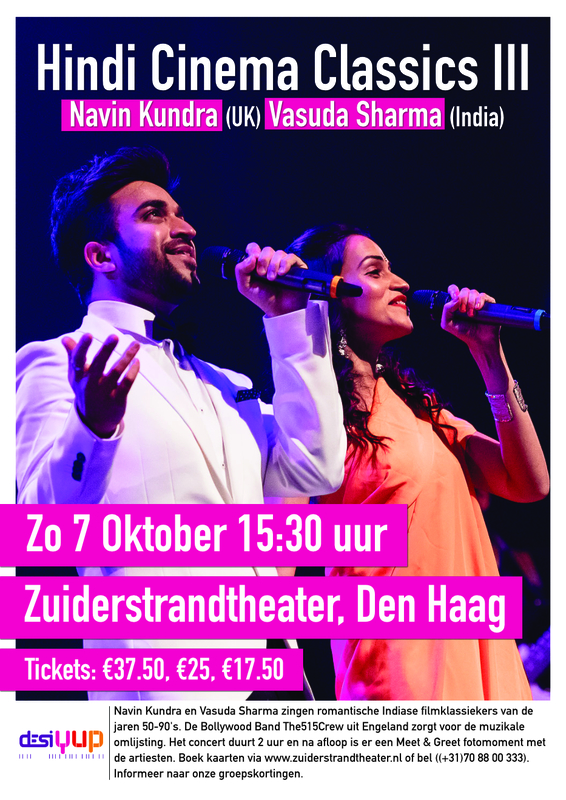 Navin Kundra en Vasuda Sharma combineren verschillende populaire muziekstijlen zoals; Indiase klassieke muziek, volksmuziek en Westerse popmuziek. Groepen kunnen uitsluitend telefonisch of aan de kassa bestellen. 17-39 persons = 20% discount. 91Spices is inspired by the kitchen of the most beautiful country in the world: India. It is diverse, colorful and full of spices and flavours! That’s why our menu includes a variety of meals from the North and South of India. With our tandoor (and original clau oven) we make our breads an prepare fresh, authentic recipes over an intense charcoal fire. This process enriches the flavours of all our traditional meals to the fullest. Who doesn’t remember the 80’s blockbuster film ‘Qayamat Se Qayamat Tak’, that made Aamir Khan and Juhi Chawla into overnight stars? Singer-songwriters Navin Kundra and Vasuda Sharma beautifully covered the song ‘Ae Mere Humsafar’, that immortalizes eternal love. During their concert Hindi Cinema ClassicsIII (7-10-2018) Vasuda & Navin will return to the roots of the rich musical heritage of Hindi Cinema and will create magic on stage. Like, Share & Comment on this video. The name Navin Kundra is hard to escape if you are part of the Asian diaspora. The British Asian singer/songwriter has graced the Asian charts often with six number #1 singles over the years. Read his interview here. Vasuda Sharma as a multi-instrumentalist has a radiant energy about her. Starting her musical journey at a talent hunt show, she’s come a long way. Days before the concert, we had a quick chat with her to chronicle her story. Read it here. â€œI personally had a beautiful moment in my life when I got to perform with Arijit Singh in 2015 at the SSE Arena in London with the Symphony Orchestra. Bollywood music is a magical and historical world of music. It is something that the decades will never forget. Old is made new and we find ourselves forever listening to classics no matter how old or young we are.